and the shortest recovery time from card breaks." "Increases maximum combo by 1 when in midair." Speak to Flora, Fauna, and Merryweather in Mysterious Tower. "A weapon that makes it easier to stay on enemies during aerial combos." Makes it much easier to stay on enemies during aerial combos." The Star Seeker is a Keychain for Sora's Keyblade and Mickey's Keyblade that is found in Kingdom Hearts Re:Chain of Memories, Kingdom Hearts II, Kingdom Hearts 358/2 Days, Kingdom Hearts coded, and Kingdom Hearts Birth by Sleep. In Kingdom Hearts 358/2 Days, it can be upgraded to the Star Seeker+. Mickey wields this Keyblade throughout his Mark of Mastery. Following Terra-Xehanort's defeat, Mickey dejectedly returns the Star Seeker to Yen Sid, thinking he has failed, only for Yen Sid to give it back to him, revealing Mickey has passed. 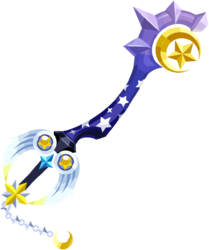 When Sora visits Flora, Fauna, and Merryweather to obtain his new clothes, he receives a copy of the Star Seeker as the Keyblade for his new Valor Form. Mickey resumes using the Star Seeker during his mission to fix the bugs in Jiminy's Journal. King Mickey wielding the Star Seeker in Kingdom Hearts coded. The guard appears to be two shooting stars. The blade is blue and decorated with stars, while the teeth is a crescent moon and a star. 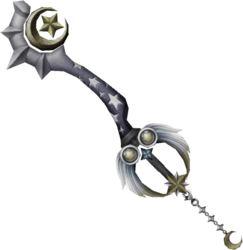 Strangely, in Kingdom Hearts Birth by Sleep, King Mickey holds Star Seeker in reverse, with the opposite side of the Keyblade used as the teeth. The Keychain design is a crescent moon. 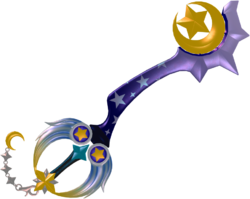 The Keyblade's name seemingly references Mickey and Sora's journeys to the various worlds, which are seen as stars. It also makes a reference to the worlds in the universe of Kingdom Hearts, since stars refer to the worlds. King Mickey can equip this Keyblade in Kingdom Hearts 358/2 Days Mission Mode by equipping the Pandora's Gear. The ground combo for this weapon starts with a horizontal slash to the left, followed by a horizontal slash to the right, a spinning slash, and ends with a large jump to the left with a dashing slash back to the right. The aerial combo consists of a horizontal slash to the right finishing with a vertical slash upward, followed by the upward slash leading into a 360° spin with the Keyblade held above the King's head, and ends with a series of three thrusts as he descends. Serah Farron's default bowsword is named Starseeker. ↑ Only available in the original Japanese release of Kingdom Hearts Re:Chain of Memories after clearing Kingdom Hearts II Final Mix, in the original English release after clearing "Sora's Story" and "Reverse/Rebirth", and in the Kingdom Hearts HD 1.5 ReMIX re-release after completing Kingdom Hearts 358/2 Days. This page was last edited on 23 April 2019, at 12:11.